HA! Mommy wants to know about a cat person whose cats bring scorpions IN the house. Maxwell: Dude! We wanna know what a cat person whose cat hunts spiders looks like...do they have, like, 6 arms?? Funny cartoon! Have a good day! 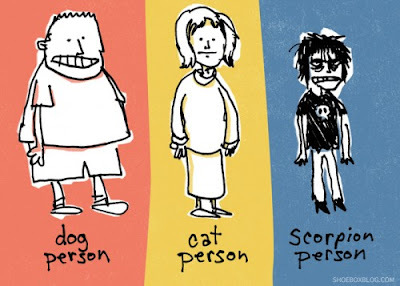 Hmm... the scorpion person looks like my human, only my human has longer hair. Hey, we think we know that scorpion person! MOL! I have seen that scorpion dude before too! If a Goth Bein had a large string instrument, would that make him a "harpsicorpion person"? The mom will have to send that to The Girl. She knows a couple scorpion peeps! Ha ha ha! The Human says she teaches lots of Scorpion People. That cartoon is fantastic. Love it. Made our person laff her head off. Have a great day.